China hasrevealed the identities of its first spacewalker and his two crewmates set tolaunch on the country?s third manned spaceflight next week, according to statemedia reports. Chinese AirForce fighter pilot Zhai Zhigang, 42, will be the first Chinese spacewalkerduring the upcomingShenzhou 7 mission with crewmates Liu Boming and Jing Haipeng, The PeopleDaily Online reported Tuesday. The mission is slated to launch Sept. 25from Jiuquan Satellite Launch Center in China?s Gansu Province. Accordingto the wire service AFP, Zhai is married and has one son. 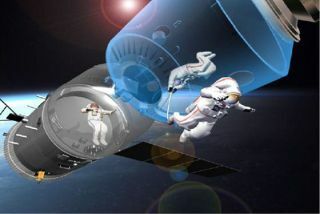 He will don a$15 million (100 million yuan) spacesuit for a planned40-minute spacewalk that is slated to include the deployment ofsmall satellite capable of broadcasting images to Earth via a CCD camera. The Shenzhou7 crew is China?s largest to date. The country launched its first astronaut, YangLiwei, aboard the Shenzhou 5 spacecraft in 2003. A two-man mission, Shenzhou 6flown by astronauts Fei Junlong and Nie Haisheng, followed in October 2005. Like Zhai,Liu and Jing are also 42 years old and fighter pilots with the People?sLiberation Army, AFP reported. They served as backups for China?sShenzhou 6 mission. Accordingto China?s CCTV television network, Shenzhou 7 is slated to launch in lateevening on Sept. 25, with landing set for Sept. 28. China isthe third nation after Russia and the U.S. to develop spacecraft and boosterscapable of launching humans into space. The country?s space program is a sourceof national pride and a symbol of China?s technical prowess. Shenzhouspacecraft are based on Russia?s Soyuz vehicles, but have been modernized andmodified by Chinese engineers. They consist of three segments — a crew capsule,orbital module and service module — and use solar panels to generate power. The orbitalmodule has its own solar panels and can remain in orbit independently of thecrew and propulsion modules, unlike Russian Soyuz vehicles. But Shenzhouvehicles do return to Earth on land like Soyuz, with the spacecraft landing underparachutes and retrorockets on the plains of Inner Mongolia. Chinesespace officials have said in the past that the country?s stepping stoneapproach to human spaceflight geared toward the development of a manned spacestation by 2010. Two follow-on missions, Shenzhou 8 and Shenzhou 9, areexpected to play a part in that goal, China Daily reported. While Chinagears up for the launch of Shenzhou 7, the country is also looking to doubleits current cadre of 14 astronauts, also known as taikonauts. A new class ofastronauts has already begun training and is expected to add another 14spaceflyers to the Chinese corps, state media reported.